Coraline crafts will make an original craft idea for your children. 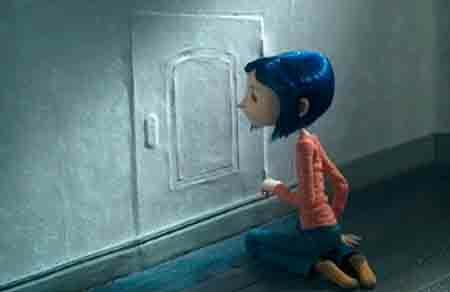 It's an interesting film that many enjoy but it is also one of the greats when it comes to crafts because of the way Coraline is designed in the films. There is so much joy to be had from making Coraline arts and crafts that children across the land are known to want to make more and more of these great crafts once their first Coraline crafts project is complete. To help you keep the children in your care occupied we have designed a Coraline arts and craft idea that is sure to keep those little ones busy and put a huge smile on their face when they have made their very own Coraline. First you want to take your pink sock and put it over your hand to see where the face pieces need to be fixed, after this you then need to make little marks with your black pen where you want your hair, eyes and mouth to sit on your Coraline hand puppet craft idea. Take your two black buttons and glue them onto the sock where you wish your Coraline eyes to be on your hand puppet. Take your dark blue material and cut it into the shape of a semi circle and make a few cuts into the material to give a hair texture to it. Next take the glue and glue the hair on to the top of your hand puppet where you put the black pen mark. Take the red material and cut it into a smile shape, you can now glue this smile shape onto your Coraline hand puppet and you have now finished your Coraline hand puppet. Now there are a huge number of craft ideas available and some are more intricate than others but when you are making crafts with children it's best to take a more basic approach. The reason for this is because difficult crafts will mean that children will lose patience and become boisterous and their attention will move elsewhere. This Coraline craft has been designed with children in mind to make something interesting but without too much technical ability required, after all its about the children making crafts and enjoying themselves. Copyright Craft Ideas Guide All Rights Reserved.